The Albino Zebra Danio is an active, robust little fish that makes an attractive addition to a community aquarium! The Albino Zebra Danio is a naturally occurring color morph of the Zebra Danio. This small, pretty fish only grows to about 2 1/4 inches (6 cm) in length. This variety lacks the pigmentation on its body surface that gives its parentage the distinctive "zebra" striping, and thus their common name. Still, this albino version is every bit as active and hardy as the regular Zebra Danio. It makes a great addition to a lively community tank with other energetic tankmates. Other common names it is known by are Albino Zebrafish and Albino Zebra Fish. Like its progenitors, this charming little Cyprinid is an ideal fish for the beginner but is also enjoyed by advanced aquarists. It is lively, attractive, and a prolific breeder. This schooling fish should be kept in a small group of at least 3, ideally 10. Because of its small size, a school will do well in a smaller aquarium, with 20 gallons being optimal. They can be housed with most community fish, but take care to make sure the small danio will not be eaten and that its tankmates are not startled by swift movement. Their aquarium needs, care, and feeding are the same as their parentage. They can withstand an impressive range of water temperature and conditions. These fish will generally do just fine without a water heater as they are comfortable down to the low 60s (F). But even though they are not finicky about water conditions, it is best to not keep your aquarium at any extreme. For a very attractive aquarium effect, create a mixed school by combining the pretty Albino Zebra Danios with some regular Zebra Danios. The mix will provide a nice contrast of swift-moving, darting color. Mixing even more varieties, like the Golden Zebra Danio, Leopard Danio, and Longfin Blue Danio works equally well and creates a really exciting effect. Don’t be surprised if the school spends a lot of time in the water flow of the filters or pumps as this is reminiscent of the swift-moving waters found in their natural environment. The Zebra Danio Danio rerio (previously Brachydanio rerio) was described by Hamilton in 1822. They are found in Asia from Pakistan to India and as far as Myanmar. The Albino Zebra Danio is a color morph of the Zebra Danio. This naturally occurring color morph is found in the wild, though many are captive-bred for the aquarium industry. This species is listed on the IUCN Red List as Least Concern (LC) as they are widespread throughout their range with no major identified threats. Other common names they are known by include Albino Zebrafish and Albino Zebra Fish. This fish prefers the lower reaches of streams, canals, ditches, and ponds. However, their habitat varies depending on the time of year. During the wet season, they are found in large numbers in seasonal pools and rice paddies where they feed and spawn. Later, the adults migrate back to faster moving waters, and the young follow when they reach maturity. The substrate of the clear, freshwater streams is normally rocky and shaded, while the still waters are silty with dense vegetation. In the wild, these fish are considered micropredators and feed on worms, small aquatic crustaceans, insects, and insect larvae. The Albino Zebra Danio has a slender, compressed body and a barbel at the end of each lip. These small fish reach lengths of only up to about 2 1/4 inches (6 cm) in the aquarium, though they can get slightly larger in a pond. They are thought to be primarily an annual species in the wild, but in captivity can have a lifespan of 3 to 4 years, though some have lived up to 5 1/2 years with proper care. This albino color variety is a naturally occurring variation of the Zebra Danio. This fish should not be confused with the Pearl Danio Danio albolineatus, which is an entirely different species. The Albino Zebra Danio is a great choice for beginners and a great companion in a community aquarium. These fish will eat just about anything that is offered as long as it floats at the surface where they can readily consume it. They tolerate water condition changes without too many issues and can even be kept without a heater. These fish are omnivorous, feeding mostly on a variety of worms, small crustaceans, and insect larvae in the wild. In the aquarium, they will eat most any prepared or live aquarium food as long as it floats at the surface. They enjoy chasing after tubifex worms, whether living or freeze dried. These fish will do best when offered food several times a day, but offer what they can eat in 3 minutes or less at each feeding. If you feed only once per day, provide what they can eat in about 5 minutes. These fish are easy to care for providing their water is kept clean. Aquariums are closed systems, and regardless of size, all need some maintenance. Over time, decomposing organic matter, nitrates, and phosphate build up and water hardness increases due to evaporation. Replace 25 to 50% of the tank water at least once a month. If the tank is densely stocked, 20 to 25% should be replaced weekly or every other week. The Albino Zebra Danio is a schooling species that will spend most of the time in the top and middle regions, particularly if there is open water or water current. This fairly hardy fish will adapt to most aquarium conditions. The waters they inhabit in the wild are acidic, but the stock now available in the hobby is many generations past this. Though a school of danios can be kept in a smaller aquarium, they will do best in a tank of at least 20 gallons. Provide good filtration and keep the tank covered as these fish may jump. These fish are most effectively displayed in tanks that bring out their colors. Use dim lighting and a dark, fine gravel or sand substrate for the best effect. Try to plan for one or two hours of sunlight hitting the tank at a time when you can view it, as the illumination will make the fish even more stunning. As with most Cyprinids, they are most at home in well-planted aquariums, and a variety of plants will make them feel safe. Some good selections include Water Wisteria, Hornwort, and Java Fern. As these fish are also extremely active swimmers, they will need some open areas for swimming. Water Region: All - They will spend most of their time in the top and middle regions of the aquarium, particularly if there is open water or some current. The lively Albino Zebra Danio makes a good community fish. It will get along with its own kind and most other species. They are best kept in a school of 5 or more of their own kind. Groups of this fish can be hierarchal, and a pecking order may emerge in the school, but nothing will come of it. Select tankmates that are similar in temperament. You want tankmates that can keep up with the fast-paced lifestyle of this fish. Mellower tankmates that need a calmer environment can become stressed. The females are larger and more fuller bodied than the males, which are more streamlined and slim. The Albino Zebra Danios are very easy to breed and may even do so on their own. Two fish will form a breeding pair, which they often keep for life. If you wish to retain the young, the breeding tank should be empty except for a two inch layer of large glass marbles, 1/2 to 1 inch in diameter. Add the female to the tank and let her settle for about a day before adding the male. When they are both in the tank, adding a few cups of cold water will cause the courtship to begin. If conditions are favorable, the female will release her eggs in open water and the male will fertilize. The eggs will then sink to the bottom and fall through the marbles, out of their parents' reach. Fry will emerge from the marbles after about 7 days. At that time or before, parents should either be removed or kept constantly well fed. 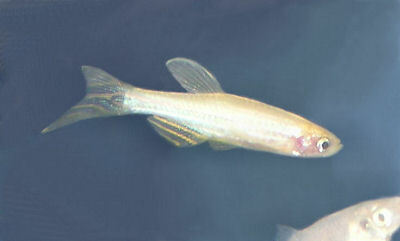 For a general description of breeding techniques, see Breeding Freshwater Fish: Barbs. Also see Fish Food for Fry for information about types of foods for raising the young. Albino Zebra Danios are extremely hardy, and disease is not usually a problem in a well-maintained aquarium. They are susceptible to Ich if good water quality is not provided. Any additions to a tank, such as new fish, plants, substrates, and decorations can introduce disease. Take care to properly clean or quarantine anything that you add to an established tank prior to introduction, so as not to upset the balance. These fish are very resilient, but knowing the signs of illness, and catching and treating them early, makes a huge difference. An outbreak of disease can often be limited to just one or a few fishes if dealt with at an early stage. The best way to proactively prevent disease is to give your fish the proper environment and a well-balanced diet. The more closely their environment resembles their natural habitat, the less stress the fish will have, making them healthier and happier. A stressed fish is more likely to acquire disease. For information about freshwater fish diseases and illnesses, see Aquarium Fish Diseases and Treatments. The Albino Zebra Danios are readily available and inexpensive. 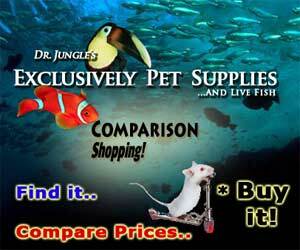 They can be found in pet stores, on the internet, and through mail order.